This game is a very smartly designed adventure game, where you will control not one, but two characters at the same time if you want. They are called, Fireboy and Watergirl for obvious reasons, as the boy can slide on ice and pass through lava, leaving the girl to walk slowly on the ice and pass through water. The tricky part is to know which one to use when. Watch out for the black gooey liquids as they cannot be passed by either of them and you will certainly have some casualties if you step on it. Reach the end of each level carefully, allowing the characters to help each other out. When one of them seems to be stuck, the other can surely pass those obstacles. Use the arrow keys to control Fireboy and use WASD to control Watergirl. 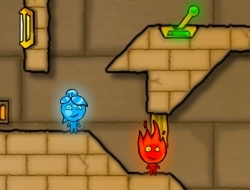 Fire Boy and Water Girl The Light Temple 6.00 between 0 and 10 based on 1 votes.